I started walking the streets of downtown Johannesburg a few years ago, before the current wave of regeneration, observing the historic architectural landscape and public art of the city and recording it with my phone camera. It’s a fascinating downtown area – little has been built the past 3 decades, and so much remains from the past, making it like a museum of architecture – Victorian, colonial, art deco, modernist, brutalist. Many buildings are still abandoned. So many aspirations, ambitions and dreams are caught in the details of each facade. Most of this series was made using lithographic plates of photographic images (my own and archival), in the studio of Joe LeGate at LL Editions in downtown Joburg. There are just 10 editions of each lithograph. The first purchase was of the entire series for the collection of Merrill Lynch. 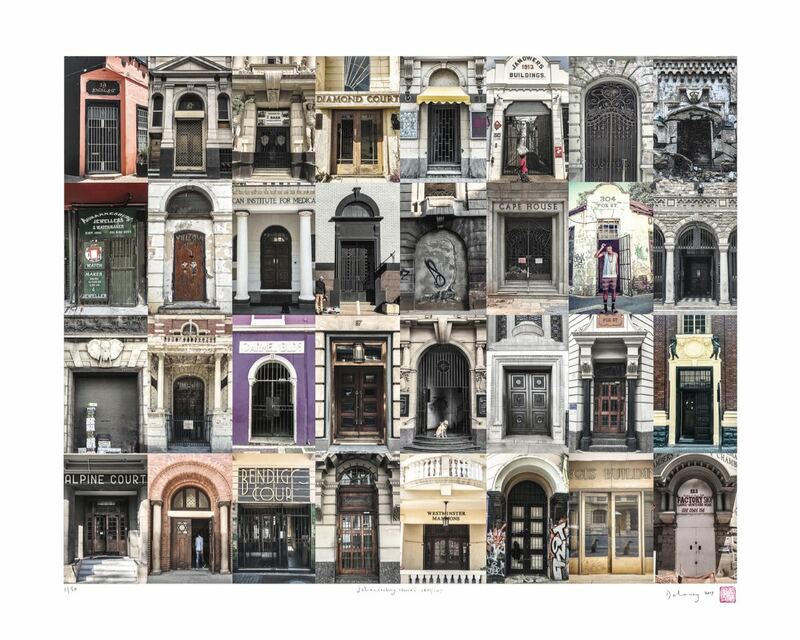 The exception is the doorways image which is a full colour giclee print, in an edition of 50. 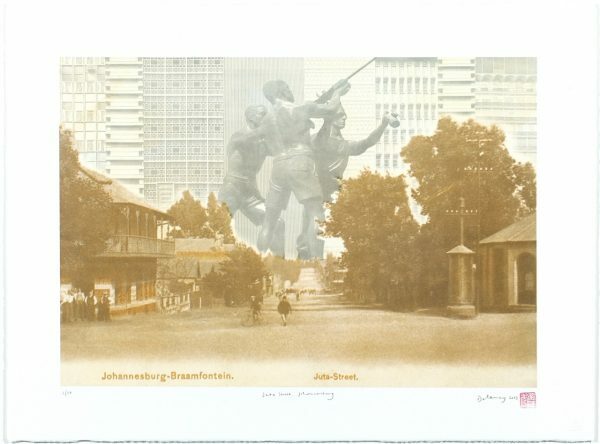 Juta Street: The Miners’ Monument towers over a very early photograph of unpaved Juta Street, Braamfontein – now unrecognisble, llined with high rise buildings. It has been a high- profile node in the rejuvenation of the city in recent years. The statue is by David McGregor, and stands in the same area. 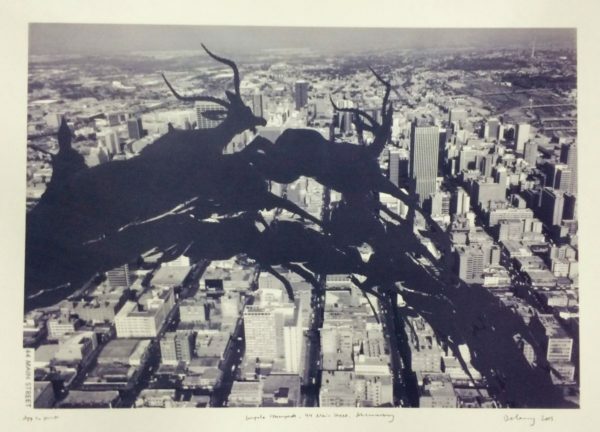 Louis Botha Avenue: Today Johannesburg is a sprawling city, built up but also famous as the world’s largest urban forest. This photograph from the turn of the 20th century shows the original landcape of rocky grassland. 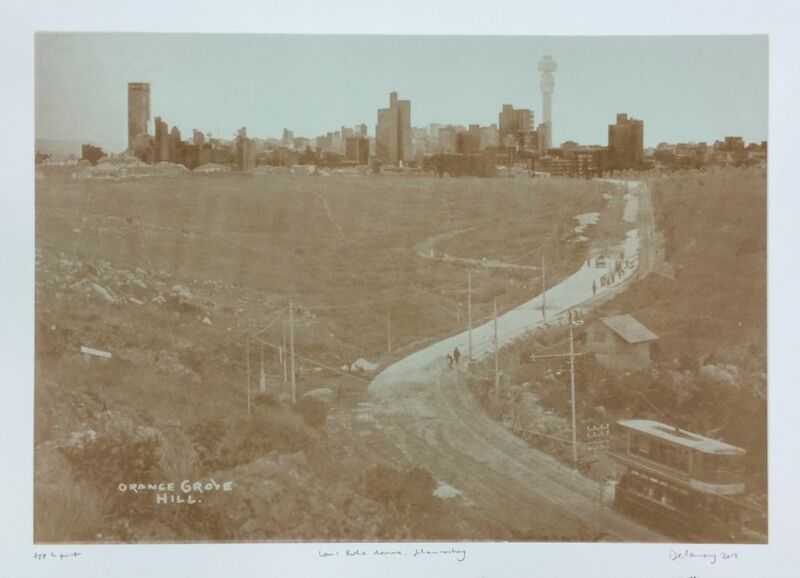 One of the city’s original trams can be seen (bottom right), on what is now an infamous bend on the 4-lane Louis Botha Road between Houghton and Orange Grove (named, bottom left). The current-day skyline has been superimposed in its actual position. 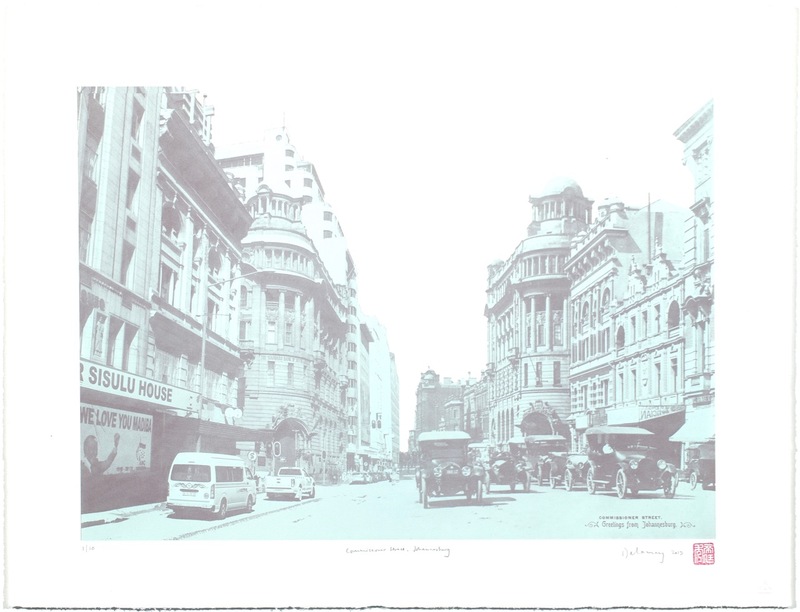 Commissioner Street: As the city grew, imposing colonial structures were built, including the head office of Standard Bank on Commissioner Street; the domed structure can be seen in this combination of images of the same side of the street about one hundred years apart. On the right, a mirror of the original image where cars give context to the time; on the left the unbiquitous taxi and references to Mandela and Sisulu do the same. 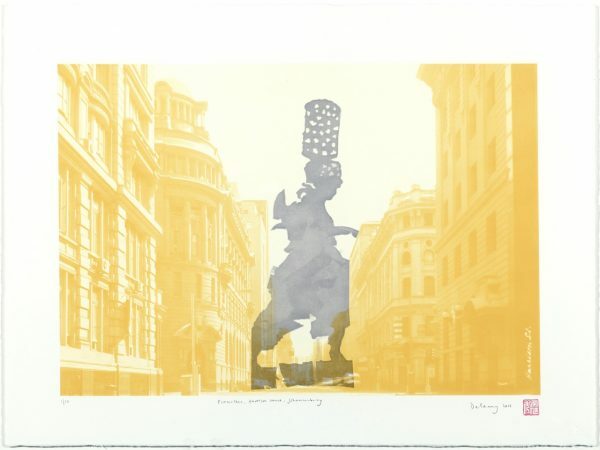 Firewalker on Harrison Street: The Firewalker statue by William Kentridge, of a woman carrying burning coals on her head, has been blown up and juxtaposed with the ostentatious colonialism of the buildings lining present-day Harrison Street. This is part of the original financial centre of Johannesburg, and has been remarkably well preserved. The statue actually stands a few blocks away. Impala stampede, 44 Main Street: Herman Wald’s sculpture “The Stampede” was commissioned by Harry Oppenheimer, patriarch of the Anglo American empire, which developed and owned much of the city. It was installed in a fashionable location downtown in 1960. 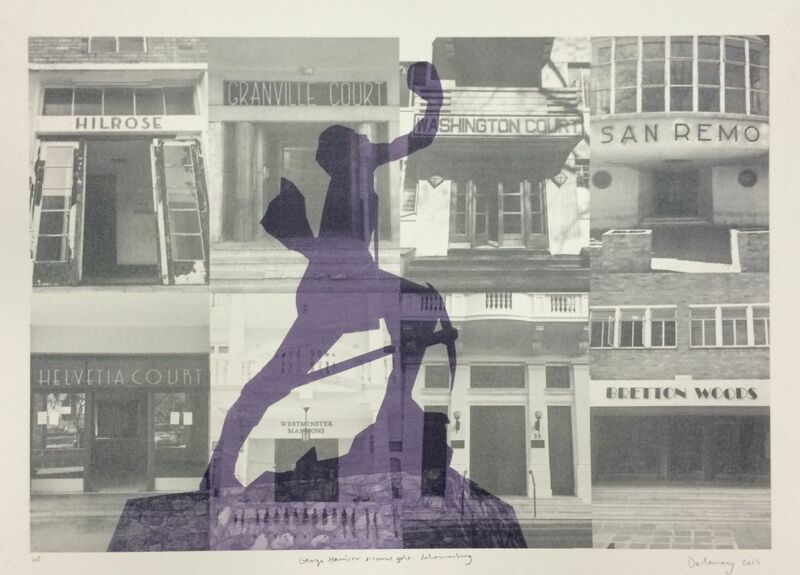 As the city fell into neglect in the later part of the 20th Century the sculpture was damaged and taken down. It now stands outside the Anglo head office at 44 Main Street, in a beautifully restored part of the city. The main image of central Johannesburg was taken by the artist in 2015. Eland at 1 Jan Smuts Avenue: The statue of an Eland by Clive van den Berg now stands at the entrance to Braamfontein and the CBD, and alludes to the landscape 150 years ago being a grassland populated by African game. The doorways are from different times in the city’s history and although all started as grand in some form, their varying condition reflects their changes in fortunes over time. Harrison discovers gold: George Harrison is credited with discovering the gold reef on which Johannesburg is founded, and this statue of him by Tienie Pritchard stands at the eastern entrance to the city. People came from around the world to make their fortunes, and the names of the grand apartment buildings in the suburbs of Killarney and Yeoville allude to the places they came from. The city has one of the world’s greatest concentrations of Art Deco architecture. Today some of these buildings remain highly desirable addresses, others are slums. 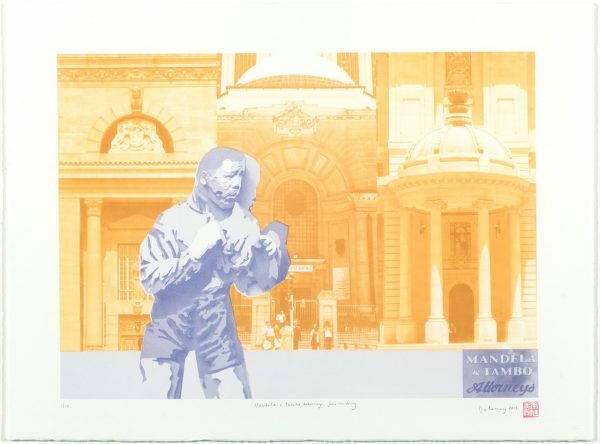 Mandela & Tambo Attorneys: The statue of a young Nelson Mandela shadow boxing, by Marco Cianfanelli, stands opposite the chambers he shared with Oliver Tambo in the 1950s. 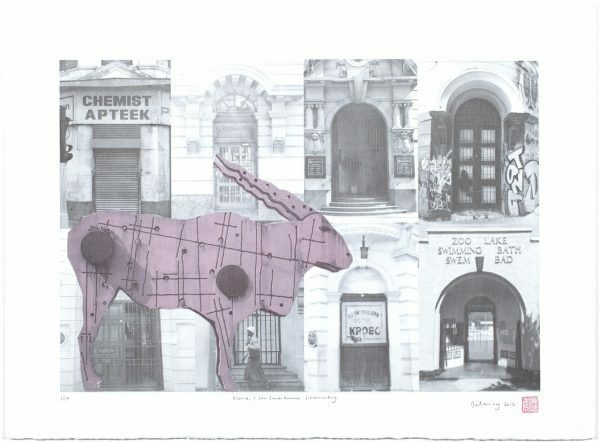 The background is a composite of places he would have encountered in the course of his work in central Johannesburg – the Magistrate’s Court, High Court and former City Hall.